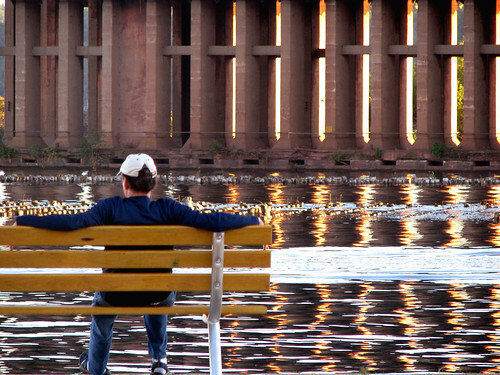 My photograph, Man on Bench, has been accepted into “North of the 45th” at the DeVos Art Museum. Out of 135 artists submitting 750 works I had a photo make it in. I cannot begin to explain how I feel at this moment! The DeVos Art Museum is on the campus of Northern Michigan University in Marquette, Michigan. The exhibit will run May 25-July 3, 2009. This year’s exhibition was juried by MaryAnn Wilkinson, Curator of Modern Art at the Detroit Institute of Art. The closing reception is July 3rd, and I would love to see you all! Congrats to the other artists! both the ones who made it into the show and the ones who gave it a shot. I need to thank Beth Millner who asked if I was thinking of submitting. It was her prompt that gave me the guts! !